As you can imagine, “Organic” is a hot topic in the agriculture industry. I feel lucky to have grown up, being taught the importance of a healthy diet and I also feel very lucky to be in a business where the product I sell can make a positive impact on people’s lives! There is great debate whether eating organic vs. conventional truly makes a difference in one’s health. Several years ago, there was a report that stated organic foods are not nutritionally different from non-organic, however, something very important was left out of the equation. This from The Los Angeles Times, “Stanford’s research showing that organic produce probably isn’t any more nutritious than the conventional variety is mostly remarkable for what it omitted.” Still, you’ve had to be a reader of alternative media to get the real scoop on this study… I don’t think it takes a rocket scientist to figure out that eating produce sprayed with pesticides and herbicides designed to kill pests will also be harmful to human health! Another plus for eating organic is the quality. Occasionally, I hear people argue that organic produce goes bad fast. Crazy! That statement is patently, untrue. It takes a tremendous amount of dedication for a farmer to grow organically. You better believe he is using every trick in the book of organic farming to keep his crops from being eaten and therefore paying close attention to his product. It’s very easy for “Big Ag” to dust their crops with pesticides and growth promoters and walk away until harvest time. At Berry Man, we do our best to source from local, organic, and pesticide free farms. We are always on the lookout to increase our network of such growers. Organics can cost up to 40% higher, therefore it is cost prohibitive for many of our customers. A concept we are currently implementing is an “alpha” program. If we can get an organic item for a price that is comparable to conventional, we will only stock the organic product. This way, we will be able to give all of our customers a chance to purchase more organic items at an affordable price. It has long been a goal of ours to grow this arm of our distribution. The fate of organic food currently lies in the hands of the consumer. As the demand for organic food grows, so does the pressure for farming practices to change. 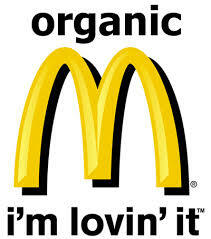 In Germany, McDonald’s is launching an organic hamburger to test the market for organic fast food. If it is successful, they will introduce it into the U.S. and other companies will be forced to compete, to keep their share of the market. In a positive scenario, the sheer demand for an increased volume of organics, necessary to supply these companies, will send farmers and producers clamoring to be part of the global organic marketplace. Wouldn’t it be interesting if the very companies that have been criticized for their negative impact on health and the environment actually, become the seeds of change?